Canadians make 545,000 tonnes of waste from gift wrapping and shopping bags every year. 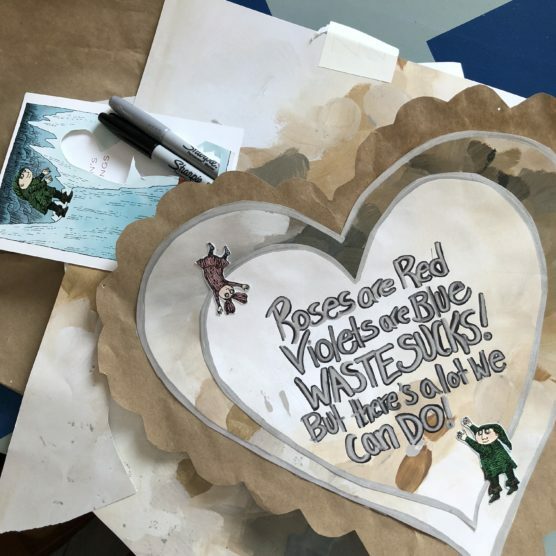 There will be an additional 300,000 tonnes of garbage created between mid November and New Years Eve and, if every Canadian wrapped 3 gifts in upcycled materials rather than buying wrapping paper new, enough paper would be saved to cover 45,000 Hockey rinks. These are sobering facts. All these beautiful wrapping papers, ribbons and bows serve only a single use and most just get thrown away. This is an expensive and wasteful practice- both for our wallets and the planet. 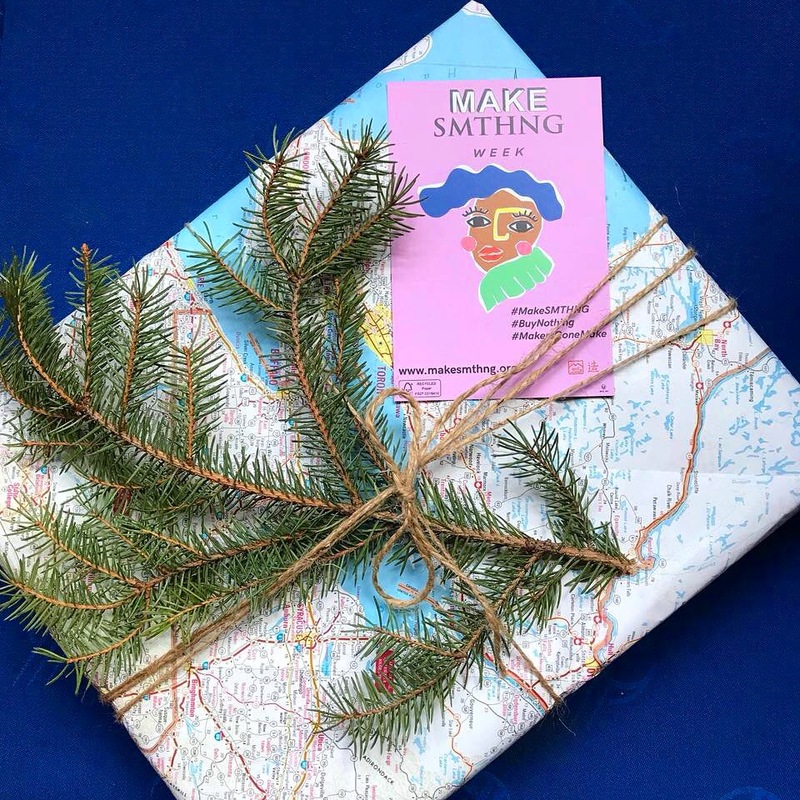 This is why we added a Zero Waste Wrapping station to our Holiday Gift Swap last year, a collaboration between the Toronto Tool Library and MAKE SMTHNG week! It was a huge success and extremely popular with our swappers, so we’re running it again at the 6th annual Holiday Gift Swap on Sunday, December 16! Toronto zero waster Your Eco Friend will be running the wrapping station using some of the techniques listed below. Maps, t-shirts, upcycled fabrics and other upcycled materials will be available for you to use, but you are also welcome to bring your own! This might just be my favourite zero waste wrapping strategy. You can use a piece of fabric or material that you already have lying around the house, or check out your local thrift store to pick up some pre-loved fabric. There are several different methods you can use depending on the size and shape of your gift. Check out this great guide for a variety of options. 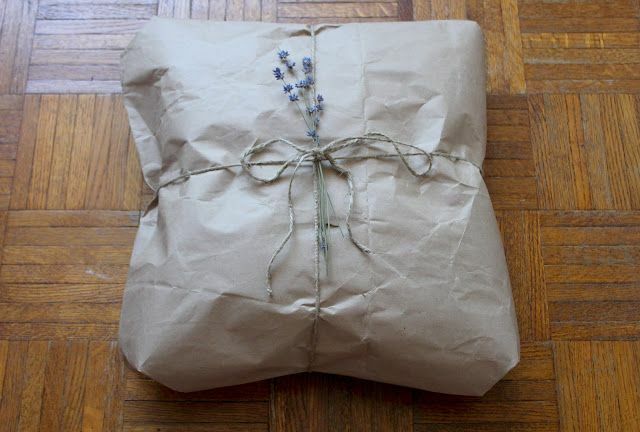 Did you know you can wrap gifts without using tape?! Because let’s be honest – not only is tape wasteful, it’s just one more barrier between you and your present! Check out this handy guide from Trash is For Tossers on how to wrap effectively without using any of it. If you must use tape, find an alternative to plastic tape – such as Washi, Paper Tape. Skip the bows and ribbons and go foraging for leaves, pine cones, berries, cedar or pine branches, etc. These can be thrown right back outside and returned to the Earth when all the unwrapping is over. Do you have a old maps lying around from a trip you took a few years back? 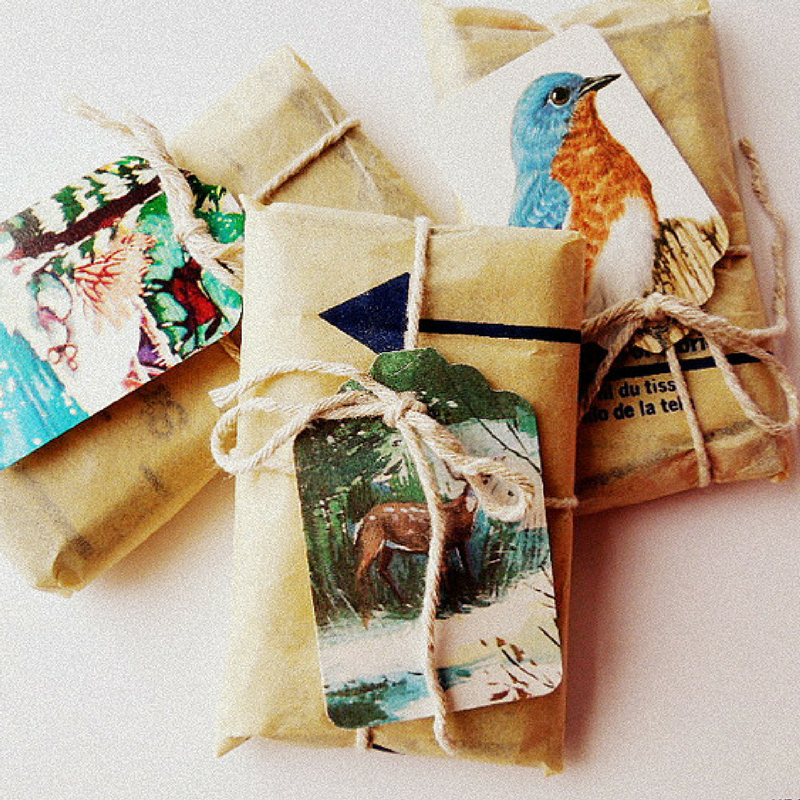 If you don’t have anyone to pass them onto, consider using them to wrap up your Holiday gifts. Not only are you reusing to avoid buying new, it’s the trendy thing to do! 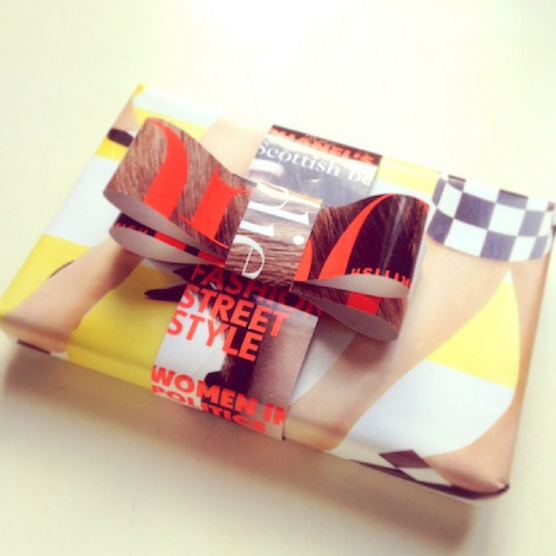 Old magazines, with their glossy finish and brightly coloured pictures, make for stylish and chic looking gifts. 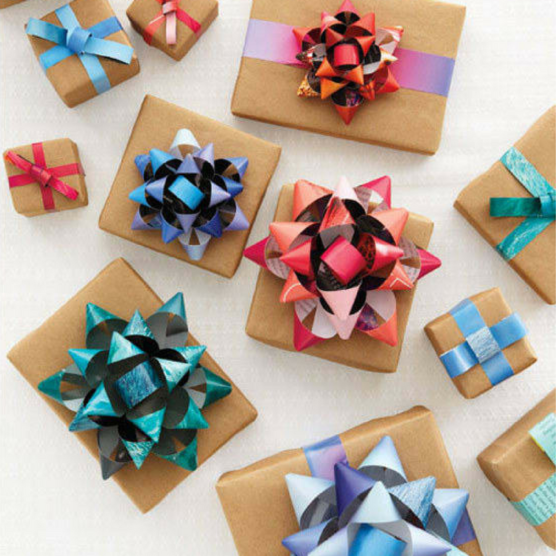 Not only can you wrap your gifts using old magazines, you can make bows out of them, too! Here’s how. Have some old newspapers lying around? 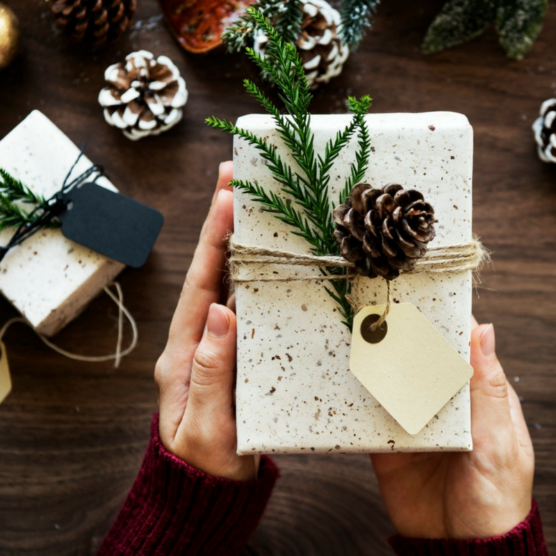 Don’t recycle them just yet – they make pretty decorative looking gifts! And if you don’t have any yourself, head to caffee shop at the end of the day and they’ll happily pass off their old newspapers onto you. 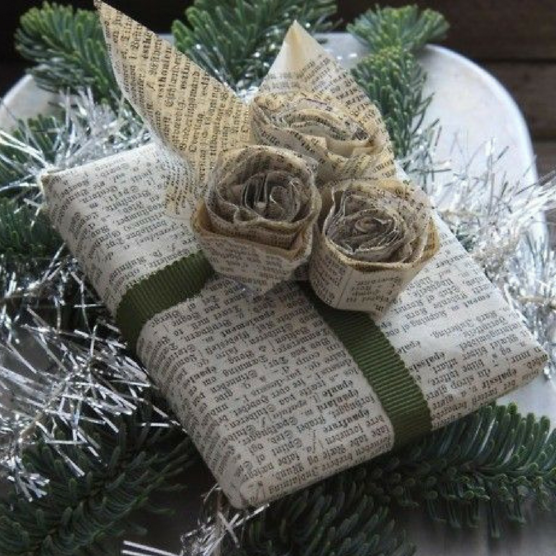 Here’s how to make those beautiful newspaper roses. Check out your local thrift store for a cool shirt or use one you’ve already got. There are a few different ways to do this – check out these instructions for a button-up shirt, see Toronto zero waster Your Eco Friend demonstrate the technique here, or watch this online tutorial. 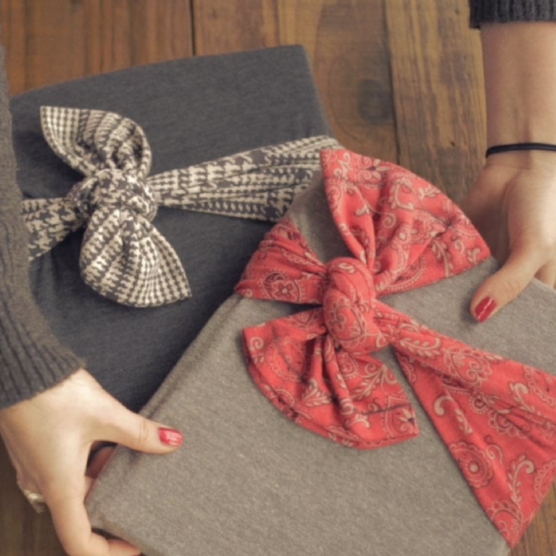 Are you giving someone a t-shirt, scarf, tote bag, baby blanket or some other cloth item as one component of their gift? 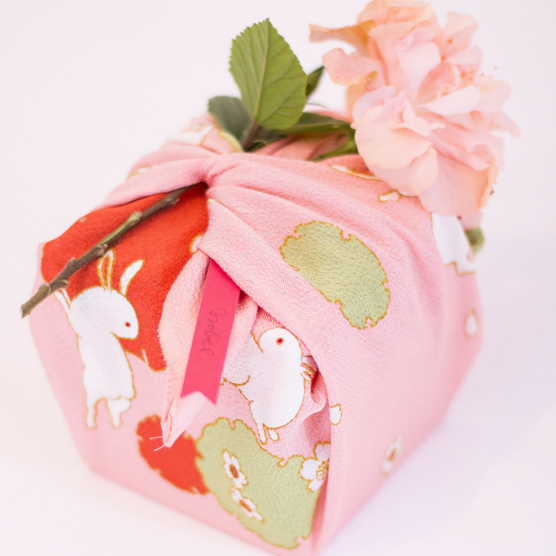 Look no further for gift wrapping and use the above described Furoshiki wrapping method where appropriate. I never buy cards new anymore – but I still receive cards from other people. I always hang onto them and pull them out at birthdays and holidays, using them to make my own cards to gift friends and family. Rather than purchasing new Holiday cards or gift tags, why not make your own from cards you have received previously? 11) Literally Use Whatever You Have Lying Around! Get creative, the sky’s the limit! I have a little basket in my home where I throw cards people send me, packaging paper or string on gifts and parcels, etc. I have recently begun adding some of my daughter’s school drawings into this bin as well (as she brings home far too many for me to keep, but I don’t want to throw them out). I pull this basket of scrap materials out whenever I have to wrap a gift. This means I don’t have to waste money purchasing gift paper and I don’t generate any excess waste. Try it – it’s fun! @itsahashtaglife is a social media manager, storyteller and blogger for non-profits and charities in Toronto. She uses the techniques of digital media marketing and storytelling to inspire an interest in environmental issues, motivating people to take action. 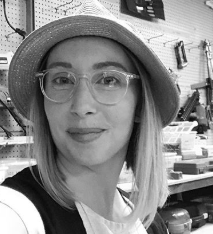 She has been aspiring to live a zero waste lifestyle for the last three years, focusing on weaving the zero waste narrative into the broader, systemic issues that are at the heart of our throwaway society.